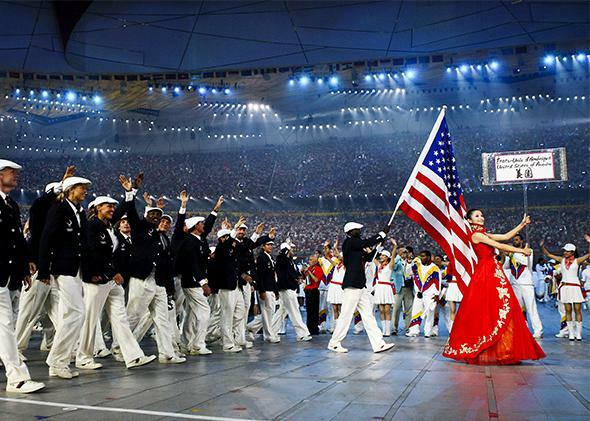 Sochi Olympics, citizenship rules: You shouldn’t have to be an American to compete for Team USA. You shouldn’t have to be an American to compete for Team USA. Team USA at the Open Ceremony for the 2008 Olympics in Beijing. Claude Giroux is one of the best players in the National Hockey League, but the 25-year-old star won’t be taking the ice at the upcoming Winter Olympics. He’s in good health and (as far as we know) hasn’t been scared away by the static surrounding the Sochi Games. The problem: his citizenship. Giroux is Canadian, and Canada has a very deep bench when it comes to hockey—deep enough that one of the best players in the world isn’t good enough to make the cut. There are surely other teams that would be glad to have him. Unfortunately for Giroux, the Olympic Charter requires athletes to have the nationality of the country they represent. Giroux carries only a Canadian passport. It was Team Canada or bust. The solution here is to give up on the pretense that the Canadian Olympic team is full of Canadians and that Team USA is exclusively for Americans. It makes more sense to allow free Olympic association, with athletes playing for any team that will have them. The Olympic Charter notes that “the Olympics are competitions between athletes in individual or team events and not between countries.” That’s exactly right. We don’t require our major-league ballplayers to hail from the cities they play for, so why should we demand anything different of our Olympic athletes? My Philadelphia Flyers count only four native-born Americans on the team roster. (The Canadian Giroux is the team captain.) We still sing the “Star-Spangled Banner” before the opening faceoff. Hockey players like Giroux aren’t the only losers under existing rules. Fans of winter sports are also deprived of seeing the best competitors. Ice dancer Piper Gilles, who was born in Illinois, was lucky to secure Canadian citizenship so she could skate with her pairs partner Paul Poirier in Sochi. No such luck for Russian Alexander Zaboev, denied the Estonian citizenship he needed to qualify with his figure-skating partner Natalja Zabijako. In individual competitions, citizenship rules also exclude athletes through per-country quotas. France and Germany won more than half the medals in women’s biathlon contests in the 2010 Games, but they only get to fill 12 competitor slots out of the 105 available at Sochi. In the Summer Games, China can only enter two players in men’s singles table tennis. For London, that meant the No. 3 player in the world, who just happened to be No. 3 in China, was left on the sidelines. International Olympic Committee nationality purists look back fondly to the days when almost all athletes had genuine social links to the countries for which they competed. But citizenship is leaky these days. Many countries with flexible citizenship rules are all too happy to issue passports to Olympic competitors. Some fast-track naturalization, waiving the usual requirements for those who proffer “exceptional services” to the state. That’s how Hammon got her Russian citizenship. Ditto for speed-skater Viktor Ahn, competing for Russia in Sochi after having won medals for South Korea in 2006. Americans, too, often discover ancestral homelands when it proves too difficult to qualify for Team USA. Haley Nemra, a born-and-bred American, had never even visited the Marshall Islands before representing that country in track and field in Beijing. Cementing a formal tie to another state for purposes of athletic competition can have costs. Yuko Kavaguti was forced to renounce her Japanese citizenship to pair with Russian Alexander Smirnov on the way to a fourth-place finish in figure skating at the 2010 Vancouver Games. Kenyan-born runners who have switched to Gulf State teams in search of better training facilities and financial support have had to convert to Islam and change their names as preconditions to naturalization. At least these athletes got to play. Many others won’t be able to navigate nationality rules on the way to Olympic competition. On top of the Olympic Charter baseline, each international sporting federation gets to add its own nationality rules. To change nationalities in hockey, players need to sign up at least two years in advance if they’ve never competed internationally for another country, four if they have. (There goes the idea of a Slovenian squad composed of other countries’ also-rans.) Under soccer and basketball association rules, there’s no switching sides: Once a player has competed for one country at the international level, he can’t play for any other. And in case you’re wondering why Russia stops at just one U.S. basketball player per team, it’s because the International Basketball Federation limits teams to a single naturalized citizen. Don’t want that Russian team to look too American! The system can sometimes be gamed, sometimes not. It encourages “quickie citizenships” where available. (Check out the case of Gary and Angelica di Silvestri, a pair of fortysomethings from Staten Island, N.Y., and Italy respectively, who now live in Canada and will be the first-ever Winter Olympians for tiny Dominica, on the basis of citizenship awarded them for unspecified “philanthropic activities.”) That does more harm to the Olympic image than a world of Olympic free agency would. If this still seems un-Olympic in some reflexive way, consider the former rule stipulating that only amateur athletes be allowed to compete. That was an ideal whose time has long since past. The games’ nationality rules have similarly outlived their usefulness. A club sports model would hardly eliminate the correlation between country of origin and country of competition. All things being equal, most athletes will want to play for the country they call home. For big-time athletes in the marquee competitions, getting wrapped up in their national flag is an important part of the performance—no amount of money is going to get Michael Phelps to swim for Qatar. At the same time, a free-agent Olympics would expand opportunities for lesser-known athletes and those in the lower-profile sports, who often struggle even as members of major-country delegations. The threat of player-raiding at that level could spur national Olympic committees and home-country corporations to higher levels of sponsorship. To the extent that players take the highest bids, fans will learn to adjust, just as Ryan Howard’s St. Louis origins are a nonissue for Phillies fans. And if they do compete under the flag of a different nation, athletes shouldn’t have to swear phony allegiance to a new sovereign. The uniform the player wears should suffice to establish sporting loyalties, for players and fans alike.